Azerbaijani representatives took part in the charity fair in Kazakhstan. 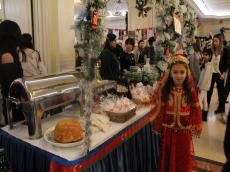 A traditional New Year charity fair was held in Astana. The fair is held annually on the initiative of the Association of Spouses of Heads of Diplomatic Missions in Kazakhstan and the organizational support of the embassies, Azertag reported. More than 40 countries took part in the charity fair. The main objective of the event is to collect funds from the sale of various goods for charity projects. Delicious national dishes and sweets, various kind of tea were presented at the charity fair. Azerbaijani wines, pomegranate juice and other products were among the most popular favorite products among consumers. Colorful carpets and beautiful headscarf kelaghai were also showcased at the Azerbaijani stand. Unique Azerbaijani carpets are well-known all over the world for their quality and high artistic value. Besides, amazing and fantastic carpets of Azerbaijan represent a real mystery, leading one inside the fairy tales full of majestic feelings. For many centuries, kelaghai was an integral part of Azerbaijani women's national costume that protects them from both the hot sun and cold wind as silk is cool in summer and warm in winter. The color of the headscarves has symbolic meaning often tied to specific social occasions such as wedding, mourning ceremony, daily activity or festivities. The whimsical drawings of the leaves and flowers overlap with complex geometric patterns. Spectacular cultural programs were also held as part of the event.